After buying three new scents for myself for my birthday, I made a solemn vow that I wouldn't buy anything else until my next birthday. I mean, I can always get samples, and I have so many that I don't need any more ("need" being an extremely relative term, I know). 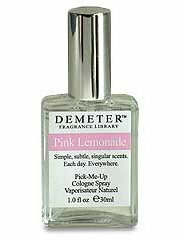 But then I walked into the local hypermarket the other day, the one which has an amazingly large fragrance department, and I was mildly shocked and very amazed to see that they've started stocking Demeter fragrances, the bastards. I tried very hard to resist, but at only $14.99 per, I couldn't stop myself. I did manage to walk out with only two, but that's two more than I had planned to buy in the next year. So I'm weak. So sue me. They have only a small selection, ten or so from the entire library of 200+: I'm guessing that the ones they stock are the most popular. Some of the ones in stock aren't terribly interesting: Rain doesn't smell like rain but like an ozonic cologne. Some of them just don't work on my skin: Chocolate Chip Cookie, while authentic enough when spritzed, smells weirdly synthetic on me, and likewise with Angel Food. Others do: Kahala Blue Hawaiian is wonderful, smelling like its namesake cocktail, a concoction of rum, blue Curaçao (an orange liqueur), and pineapple juice, but I just bought CSP Vanille Pineapple, so I don't need it (there's that word again). Orange Cream Pop is a startlingly realistic liquid reproduction of a Creamsicle, but again, don't need it, which isn't to say I won't ever get it, even though I don't need it now. All this is merely a preamble to the fact that 1) I have no self-control when it comes to scents and 2) I bought a couple of the Demeters, fun, strange scents that I'm happy to have in my collection. 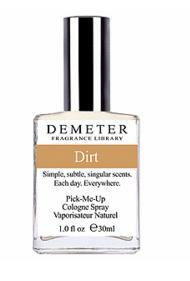 Dirt ought to smell like filth, but it actually smells like a handful of garden soil: dark, loamy, gritty. (It was evidently concocted to smell exactly like Pennsylvania farm soil, from the birthplace of perfumer Christopher Brosius.) It's surprisingly tenacious on me, and, unlike most Demeter scents, it develops: after the slightly harsh top note burns off, it's warm and enveloping and, yes, earthy--it calls up reveries of sun-drenched childhood gardening. The other one I bought was Pink Lemonade. How it's supposed to differ from regular old lemonade is, I'm afraid, lost on me, but by god it does smell like lemonade: a cold, wet, brilliant flash of barely-sweetened lemon pulp. I can practically taste that tartness: it grabs hold of my salivary glands. It has no lasting power at all; people complain about this with various scents but I've never actually experienced it before now--a scent that is literally undetectable within ten minutes. This would ordinarily be a serious deficit, but I don't mind: some pleasures, perhaps, ought to be short-lived. Most fragrances are movies; this one is a vivid short feature. 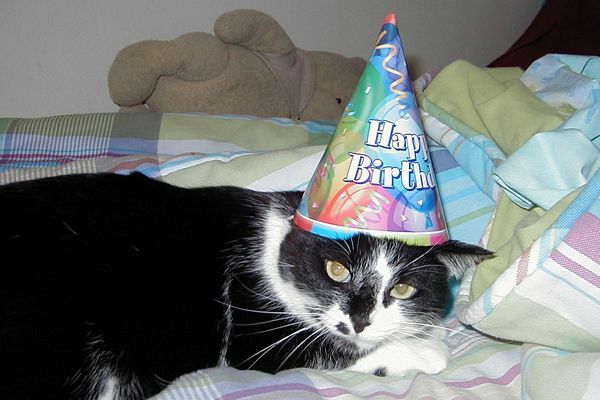 Note: author did not actually look like this on his birthday. Saturday was my birthday, so I decided to treat myself to a few things. (We don't usually exchange Christmas and birthday presents in my household; instead, we give one another license to go a little nuts. I know other people who do the same.) As I mentioned before, the local drug emporium has begun to stock Comptoir Sud Pacifique, and there were a couple of those I very much wanted, as well as another scent I'll get to in a minute. I calculated that if I bought any two, I could use the store's bonus-points card to get a third one for free--my birthday gift! I got to the store and started browsing the CSP display just as two young women were completing a transaction (boring old makeup, as it turned out). They hadn't noticed the display before, and as I sprayed some blotters to make sure I was buying the ones I wanted, they took interest; they'd never smelled anything quite like CSP before. We started talking, and, as has happened before, they began to wonder if I didn't work for the company. I assured them I was just a big fan, and they tried nearly all the scents on their arms before eventually one of them bought the irresistible Amour de Cacao. I picked up my choices--Vanille Pineapple and Aqua Motu--and headed to the counter. I said to the saleswoman, "I am going to be needing a whole lot of samples, too." She started pawing through the cabinet and pulling out this and that, and of course the two young women wanted some, too; who doesn't like free things? They asked if there were any other CSP samples: the saleswoman headed out back to the storeroom to check, and came back with a big handful plus two little fuchsia purses stuffed with miniatures: "Lancome freebies," she explained to the young women. Then she said to me, "Now I have to find something for you," and began rooting around in the cabinet once again. Eventually she held up a silvery Givenchy cocktail shaker, of all things. Would I like it? Would I! It's free, isn't it? I've never made a martini in my life, but now I suppose I'll have to start. So: upon buying the CSP scents I wanted, I got a dozen or so samples, a cocktail shaker, and a bottle of L'Instant de Guerlain Pour Homme--a pretty good birthday present, I think. 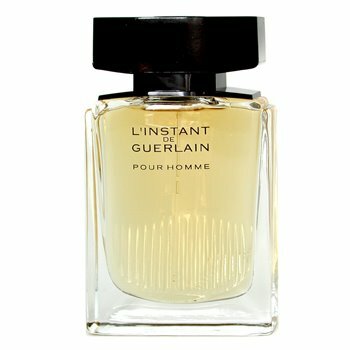 The opening of L'Instant de Guerlain Pour Homme is thrilling: I don't know of another word for it. It's cold, a shiver of citrus and star anise (also called badian), and it's so startlingly fresh that it puts many would-be fresh scents in the shade. But L'Instant is above all an oriental scent, and as the scent heats up on your skin, the warmth begins to emerge: a suggestion of floralcy, a sweet persistent caramel-like note, and a soft cloud of patchouli. The sweetness, mostly from ambrette, persists to the end of the scent, accompanied by dark rosewood notes accented with cocoa and vanilla. I am, of course, a big fan of terrific packaging, and the L'Instant bottle is wonderful, a study in contradictions like the scent itself. (The photograph doesn't do it justice; you need to hold it in your hand.) The box is dark brown, hinting at the scent inside, but the front and back are subtly pinstriped. These stripes are echoed on the bottom third of the bottle--but they're not on the front, only on the back, leaving a smooth expanse of glass for the front. From the front, the bottle looks like a solid block, with a little curvature at the top and a matching one at the bottom of the cap, but again, looks are deceiving: the side view reveals that the the bottle bellies outwards and upwards, with the inner cavity tapering almost to a point at the bottom. It's so elegant, so perfectly thought out, that it's practically a work of art, just like the scent inside. Hot on the heels of 1994's ground-breaking CK One came a slew of knockoffs, of course: there are a few innovators in the fashion industry, of which the fragrance industry is now inextricably a part, and everyone else jumps on the latest bandwagon. So we got bunch of CK One clones: citrusy, herbaceous, musky, pleasant, unisex, safe. Gieffeffe by Gianfranco Ferre, Benetton's Hot and Cold, various eaux such as Eau Fraiche de Caron, Dalimix.... As recently as 2001, Cartier launched Eau de Cartier, which bears a strong family resemblance; fragrance houses are probably still doing knockoffs. (CK One wasn't the first unisex, or "shared", scent, not by a long shot, but it was the first huge seller in that category, tapping into the zeitgeist as all Calvin Klein scents are meant to do.) Even the packaging of these scents is generally all of a kind, sleek and nondescript. 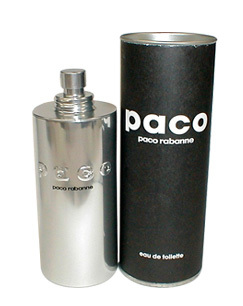 Paco by Paco Rabanne was part of the trend, and there's no doubt upon smelling it that, two years after the launch of CK One, it's a copy if not an exact double. The top notes are similar: bergamot, pineapple, muted spices. It's all very brilliant, just this side of harsh, and a little synthetic; no fresh fruit here. The middle notes of both scents consist of flowers, artfully draped behind greenery so as not to seem feminine. In Paco, it's leafy, bone-dry geranium and tea that form the disguise. Both also have base notes including musk and ambergris, a seemingly indispensible pairing for unisex scents. There's nothing, really, to distinguish Paco from its cluster of imitators, and yet I kind of like it. I don't love it madly, but every now and then I'll look through my collection wondering what to wear, and I'll spot that embossed aluminum canister and think, "Just the thing!" Because sometimes it is.